46 Records Returned 10 Records Displayed. Description: This program adds a button in Vista Data Collection Timecard Entry which, when selected, will create a Receipt to Inventory from Manufacturing for the job and quantity reported on the current entry. Description: This program will alert the user if scrap has been reported to a job in Vista Data Collection Shop Floor Entry. Description: This Vista program allows Data Collection employees to only clock into jobs that have been released to the floor and are not complete. Description: This program adds setup entry to Vista Data Collection Timecard Entry with a predefined value of time if a production entry is added. This prevents the user from being forced to clock in to both setup and production on a job. 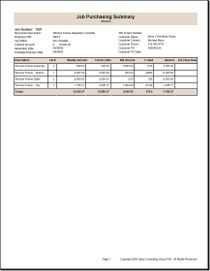 Description: This Vista Open Purchase Order report will print for Inventory, Job, Subcontract or all purchases and also prints PO memos! Description: On Vista RecordSave and when purchasing for a job, determines if the Vendor is an approved supplier for the customer. Description: Shows all Vista open order lines with remaining quantity, next release quantity, date and value. Also shows linked jobs and the current job operation. Description: Prints for a user defined order or range of Vista orders, and displays the Sales Order information, inventory quantities on hand, allocated and available, linked jobs with status and Job History for the Part. Description: True exception reporting in Vista! 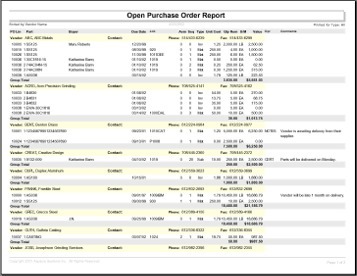 For a user-specified range of parts and customers, the Shortage Report lists all order releases through a cutoff date where not enough parts are expected to be available to fulfill the order. 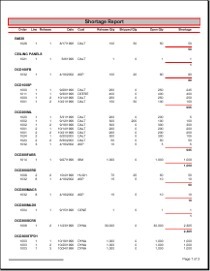 Description: Vista report that shows material requirement estimated and actual costs summarized by assembly for specified job.